A clump forming herbaceous perennial with a bulbous corm-like rootstock which spreads steadily. Foliage emerges in spring, each leaf blade resembles those of grass except that these are covered with fine filamentous hairs. Ideal for containers and troughs or any well drained spot in the garden. From the centre of each loose rosette of leaves rises numerous flower on short stems, usually one or two flowers per stem. 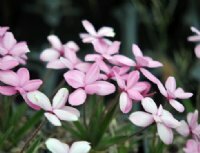 These are over 1 cm wide and composed of 6 petals, colour is mid soft pink almost flourescent, a scent is not present or very feintly so. Quite a sizeable flower hence the name!